Many of us fancy ourselves visionaries, so far ahead of our time, the world only catches up years after our death. He blames his failure to gain instant success on the crowd’s misapprehension, but he seems willing to do anything to please them: Dress like a mythical outlaw, grow his hair long, dance and quiver like Elvis, even climb to the top of the mountain. Yet it is clear what our hero desires from all of this: To be a legend, to achieve immortality, like Elvis, like Robin Hood or Nietzsche’s Ubermensch, braving frozen wastes to conquer the snow capped peak. ‘No-One Came’ is about failure. A warning to all future musicians that fame is granted to the few and immorality to less. The best you can hope for is to live for now, to embrace fame for the time it is given you and accept it when it’s gone. "You spend your money and lie in bed forgotten, and you wonder what you did it for." Which Deep Purple then punctuate by performing a grinding solo section. Coming out the other side, it’s as if our hero has emerged from a trance. He has seen into the future, as told in the previous verses, and awoken the same idealist he was at the start. He recognises the two-facedness of show business and wonders if he can make it by being honest. He knows the best that he can hope to achieve, but sees that, "It’s only the glitter and shine that gets through", reaching for his Robin Hood outfit. He makes it, but has seen his fate ("I've come and I've gone before you wink an eye"), and crashes and burns just as he has foreseen. Fame is transitional, but the money’s good and you have some fun, which is the best you can hope for. It’s like life. And like life, the journey is more important than any destination. ‘No-One Came’ is a gem of a song on an album of great tracks. Any album with a song named after an Isaac Asimov character (‘The Mule’) gets my vote. Ian Gillian has said that the inclusion of ‘Someone’s Daughter’ was a mistake, but it’s a bit of fun and a natural break in the wall of unrelenting melodic rock. 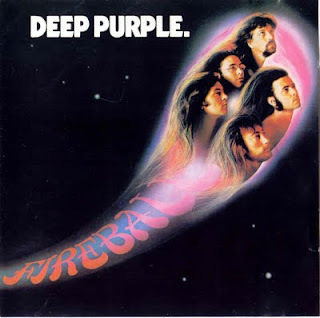 ‘Fireball’ also has its title track to recommend it, one of the greatest opening tracks, with an opening itself that demands attention, and a Hammond organ solo of sheer class. As ‘No-One Came’ remind us, the best that a musician can hope to achieve is to compose a piece that will live on beyond them, bring pleasure to future generations, and ensure their immortality. Mission accomplished lads.